Do you like contemporary dance? Do you like expressive movement? I enjoyed the dynamic movement in Nullius in Verba: A Double Bill Dance Performance the most. It is playing at the Al Green Theatre as part of the 2018 Toronto Fringe Festival. 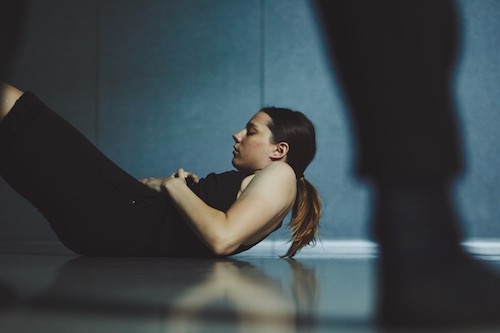 The collective Rebel Dance Theatre (currently listed as “Rebel Yell” in all Fringe promotion material – the company announced their updated working title before the performance) describes this work as two separate choreographies about power and revolution. The piece started with dancers Robyn Noftall and William Hamilton standing half dressed in a stage scattered with various clothes. Eyes closed. Bodies in a kind of suspension. They very slowly get dressed with a delicate quality of movement. It was captivating watching the dancers’ bodies struggling under the immense pressure of moving so slowly. I love the attention to detail in the piece. The dancers move and hold their bodies with a lot of complexity and nuance. The dance as a whole offers great contrasts between floaty stillness and sharp dynamic rhythm. While there were elements I loved in the piece, I did find that it felt filled with many moments of stillness and caution. When faced with those moments I kept wanting to see the dancers break that and move back to the more dynamic movements. The lighting in Nullius was beautifully dynamic for both pieces. It accompanied a variety of atmospheres through the dances setting the tone nicely. This beautifully lit atmosphere was present in my favourite segment. A piece titled “That What We Do Not Yet Know” by choreographer Mateo Galindo-Torres. It was the striking movement, accompanied beautifully by the rhythm of the music that made his piece stand out for me. When combined with the costume design that accompanied it, the dancers were transformed into ethereal figures. It was such fun! The version of the performance I saw was a preview, so the experience I had from my viewing might not represent the experience you would have in future performances. If movement in performance is something you appreciate, definitely give this show a look!